Should I Start My Business on Etsy? I get asked this question – or a variant of it – all. the. time. Whether you are starting a handmade business, a vintage business, or a supply business, it matters not. My answer is still yes. Why Etsy and Not Your Own Site? I love Etsy. Without Etsy, I probably wouldn’t have started my business, and I have no doubt I would not be where I am today – able to make a full-time living off selling my jewellery online. Etsy was my springboard, absolutely. I have had my own website for a few years now, and it is growing more and more every week, month, and year. I have to WORK to get people to my own site. But my Etsy shop ticks over with very little work on my part, thanks to the years of sales, feedback, and large range of well-photographed products I have on there. I’ve heard some people say that you should leave Etsy behind when you get ‘successful’ enough, because it dilutes your focus and pits your brand against many others that are not of the same caliber. To the former I say rubbish. I have my jewellery in as many online venues as I can manage. Why? Because my business is based on reproducible designs, I treat venues like the marketing tools they are – the more places you can find my jewellery, the more likely you are to BUY my jewellery. Etsy is definitely, by far, the best online venue for bringing me new customers outside of social media. To the latter I say… welcome to the internet. No matter whether you have your own site or are on a venue like Etsy, you are still pitting yourself against a whole internet full of competition. Frankly, you really should make sure that your shop shows up on the most highly-trafficked search engine of handmade – Etsy. I don’t know about you, but when I want to buy something handmade, I don’t Google it… I Etsy it. Etsy is my first port of call to buy handmade, vintage, and supplies… and the same goes for many millions of Etsy members (the last stats I could find was 20 million as of the end of 2012). Why would I eschew such a fantastic market? Perhaps if you’re already huge – you have a well-known blog or you’re ‘big on social media’ – you could get away with launching your own site – and keeping it that way – from the get-go. But 99.9% of us are not in that position. We’re just starting out. In the beginning or middle stages of our business – still figuring things out and building a customer base. I don’t know about you… but I need to eat. So long as Etsy still works for my business, I’ll keep selling there. We’ve all heard the stories of shops getting unfairly closed – or of re-sellers flourishing while genuine handmade sellers falter. Those things happen. Those things are why you should DEFINITELY get your own site set up and going as soon as you can make it happen. You should 100% ABSOLUTELY get your own online real estate up and running asap. But that doesn’t mean throwing everything else out the window. It isn’t an either-or proposition. Etsy isn’t perfect – but it’s the best thing out there if you want to get your handmade business off the ground, and keep it growing. In short, here are a few compelling reasons why you should start – and continue – your business on Etsy. These are just some of the reasons I believe Etsy is the best place to start – and grow – your online handmade business. 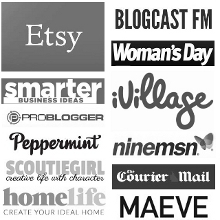 Do you have a business on Etsy – or are you thinking about starting one? Why do YOU sell there?